We’ve chosen a demolished fenced storehouses area, placed in the Horta-Guinardò district of Barcelona, because it’s a local and medium scale site witch could represent a common situation in european cityscape, where citizens looking for interfaces area to connect with. Also we think, there is a lack of community and green public spaces in the city. We would like to keep it as no-building area and convert it in an Urban Open Space Citizens Laboratory. 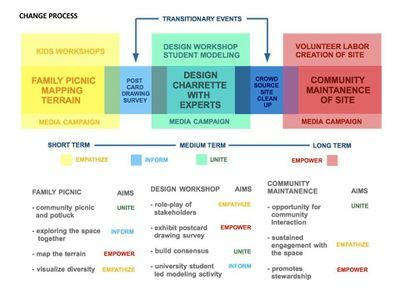 We think it could be a good starting point for improve community testing space for sustainable and community building-up practices in the neighborhood. What are the major challenges for changing the situation? The first thing we see as challenge for changing the situation, is about district daily life separation due to the accentuated topography and the facilities placement faraway from that area. Barcelona citizen has a really strong sense of the neighborhood and their routine is almost made in a proximity of 500 m area. If that situation is true in the flat neighborhood of the city, in case topography accident is more evident. That’s why we personally see the continuous community engagement as a potential problem. The second one, is about the public license for the use of the space during design or/and construction phases. It would have to confer in a little time in order to not lost the citizen participation. Furthermore, the public and /or private fundraising could be change the quality of design and actors engagement. What could be a starting point for democractically-based change? The interesting landscape characters of the place would be show up to citizens as a base of a consensus design. An other really good starting point could be design a button-up program proposal and trying to connect with similar project in the city in order to create a network and obtain social support. 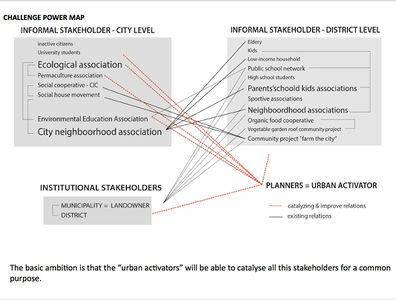 Further, it could be useful to make a powerful program to “wake up” the citizens emotional sense of place, starting to engage closer schools and community association. At the same time, it would be beneficial organizing fundraising events and start a dialogue with town administration and political actors. Look at the various methods and tools available and think how they can be applied creatively. Think about the needs of different stakeholder groups - you may need a methodical mix to address them all. Illustrate graphically how these methods/tools might be applied in a short, medium and long-term perspective. 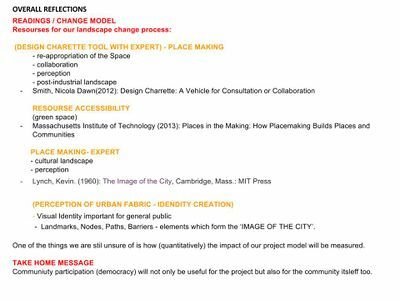 -	re-appropriation of the Space -	collaboration -	perception -	post-industrial landscape -	Green space -	cultural landscape -	perception. The perception of urban fabric and identity creation was based on, Visual Identity important for general public and Landmarks, Nodes, Paths, Barriers - elements which form the ‘IMAGE OF THE CITY’. One of the things we are still unsure of is how (quantitatively) the impact of our project model will be measured. Community participation (democracy) will not only be useful for the project but also for the community itself too. This page was last modified on 16 June 2016, at 18:15.